A true beauty icon in the Fresh product range, Rose Face Mask has soothed, hydrated and nourished fragile complexions for more than 15 years. To celebrate this anniversary, Fresh invited multimedia illustrator Jo Ratcliffe to revisit the packaging of the unique mask. Each jar of Rose Face Mask is infused with two and a half Rosa Centifolia roses that liberate the soothing and toning effects of this exceptional flower. Recognized as one of the purest skincare treatments ever created, Rose Face Mask is emblematic of Fresh, it respects the delicate nature of the skin and has an immediately soothing effect. Fresh products are designed to enhance the effectiveness of natural ingredients and provide unique sensory stimulation. 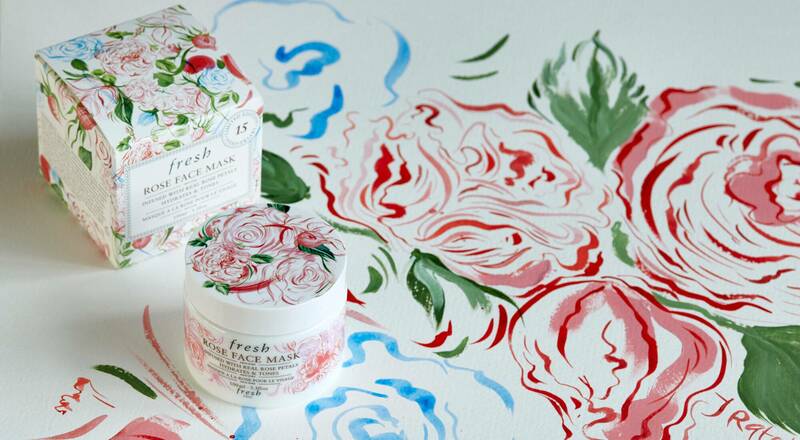 Illustrator Jo Ratcliffe drew on the imaginary world of roses and its representations over the ages to create a unique packaging for the 15th anniversary of Rose Face Mask. Known for works that blend different techniques, media and myriad inspirations, she imagined a fluid, evanescent motif to decorate the jar and its box. Her creation evokes both the rose itself and the sensation of lightness the mask creates on the skin when it is applied. A true work of art for an unrivalled skincare treatment.